Wish you could download the news into your brain while you slept? Well you can’t do that just yet, but a New York City college student may have invented the next best thing. 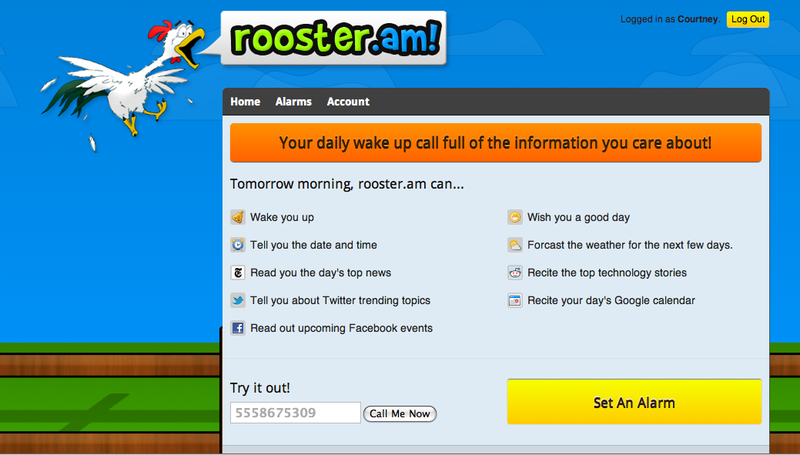 Rooster.am is a crazy alarm clock, which not only wakes you up with “Cockle Doodle Doo” but also reads the news to you that you missed while you were sleeping. 20-year old hacker Ian Jennings unveiled his project to a group of 750 local tech enthusiasts at the monthly NY Tech Meetup. The alarm wakes you up by sending a voicemail to your phone. You can choose from the following options: weather, NYTimes, Reddit News, Twitter trending topics, Facebook news stories and Google calender events. Today it is 50 degrees fahrenheit and Partly Cloudy. Humidity: 48%. The forcast for the next 3 days is as follows. Wednesday, Sunny with a low of 41 and a high of 54. Thursday, Rain with a low of 42 and a high of 54. Friday, Showers with a low of 38 and a high of 53. Good afternoon, it is 2:48 pm Wednesday November 11, 2010. The trending topics on twitter this afternoon are: #inhighschool, #incollege, and African Americans. The top scoring links from reddit this afternoon are as follows: 1, Why is Shoppers Drug Mart pulling 3,500 copies of Adbusters, my magazine, off its shelves? “A week ago, in the National Post, the Canadian Jewish Congress (CJC) accused Adbusters of anti-Semitism for publishing side-by-side photographs of the Gaza and Warsaw ghettos…” in worldnews. 1072 upvotes and 342 downvotes. 2, America is like the girl that keeps getting back together with that abusive moron everyone hates. in reddit.com. 1130 upvotes and 412 downvotes. 3, Anyone else catch this? just now? in pics. 10593 upvotes and 8318 downvotes. Try This: Lazyscope. Twitter meets RSS reader; subscribe to anything. Rooster.am won this year’s HackNY annual hack-a-thon. HackNY is a nonprofit founded by a three computer scientists in 2009 aiming to fertilize the New York tech community by hooking up college students with internships at local start-ups. Jennings, whose actual last name is Jablonowski, is a junior at Rutgers University in New Jersey who listens to trance music all night long. The New York Observer recently described the former bit.ly intern as a fast-talking, pierced hacker with pointy black hair that looks like that of an anime character. Jennings won HackNY’s annual hack-a-thon last year as well with an app that used Twitter and Foursquare to determine the most “influential” person (as opposed to mayor) at a given place ranked by their Twitter followers, important friends and listed occupation.